CollageIt is a free collage generator. The premise of this program is quite simple: instead of wasting time with editing software or graphic editors, you can create beautiful collages with CollageIt literally within seconds. To begin, add images to the left panel by clicking the Add button. Then click "Generate Preview" to see the collage in the center frame. Version 1.9.5 is a freeware program which does not have restrictions and it's free so it doesn't cost anything. 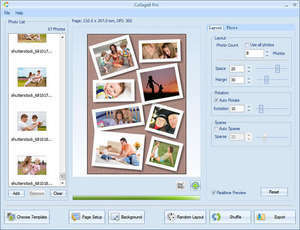 For security reasons, you should also check out the CollageIt download at LO4D.com which includes virus and malware tests. Additional screenshots of this application download may be available, too. CollageIt has a presence on social networks.